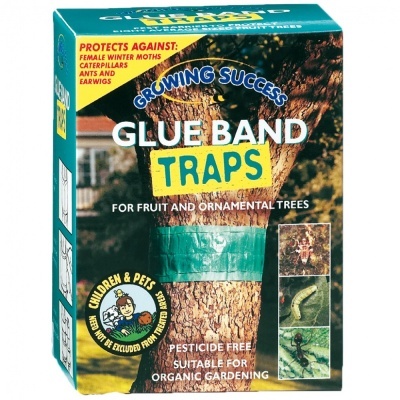 Growing Success Glue Band Traps from the Westland range of gardening products, provides a pesticide free Organic pest control solution for fruit and ornamental trees. Green band (total size 1.75m) is cut to size of each tree circumference, forming an extremely sticky barrier to prevent wingless female moths and ants from climbing trees to lay their eggs. Suitable for prevention of damage from three common species of moths, whose eggs hatch out into caterpillars and feed on young leaves and fruit in Spring. Ants also are prevented from climbing trees to farm blackfly and greenfly, as they collect sugar-like substance as food to take back to the ant nest. Green colour band is not attractive to beneficial insects. Apply glue band in early Autumn and re-apply between May and August.